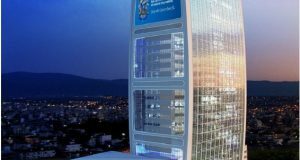 Digi reported its Third Quarter 2018 (3Q18) financial results last week. 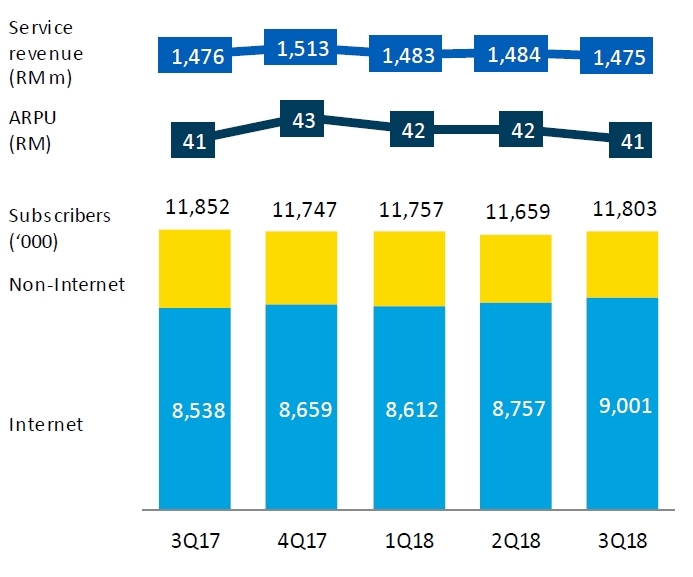 There are now 11.8 million Digi mobile subscribers up from 11.66 million subscribers it had as of 2Q18. 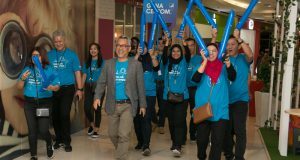 The Telco added 144k new mobile subscribers between July, August and September 2018. There are 9 million Internet users (vs 8.76 million in 2Q18), representing 76.3% of its total mobile subscribers (75.1% in 2Q18). These Internet users consumed an average 9.1GB data (per user) in 3Q18 (vs 8.2GB/user in 2Q18). Digi said that 7.5 million of its Internet users have access to the 4G LTE network (vs 7.1 million in 2Q18). About 2.8 million Digi customers are not using any mobile Internet service. These include 314k postpaid subscribers and 2.49 million on prepaid. About 77.4% of its mobile subscribers are smartphone users (76.1% in 2Q18). Digi sold 132k devices in the quarter (116k in 2Q18). 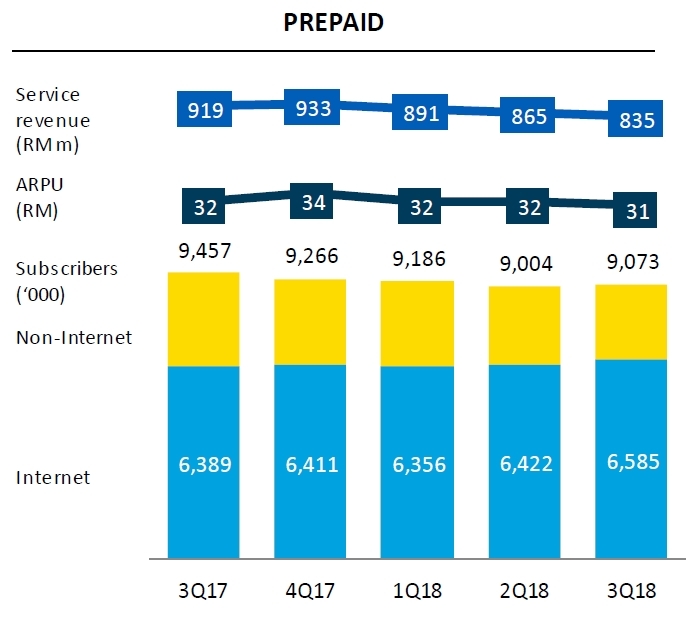 As of 3Q18, there are 9.07 million prepaid subscribers (vs 9 million in 2Q18), “fueled by strong postpaid growth and stronger internet uptake from prepaid although challenged by intense data price competition and continued decline from prepaid legacy services”. 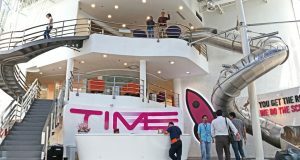 ARPU for Prepaid stood at RM31 (vs RM32 in 2Q18). Postpaid subscriber base was at 2.73 million as of 3Q18 (vs 2.66 million in 2Q18). Digi said entry level postpaid plans contributed 75,000 net adds in the quarter. 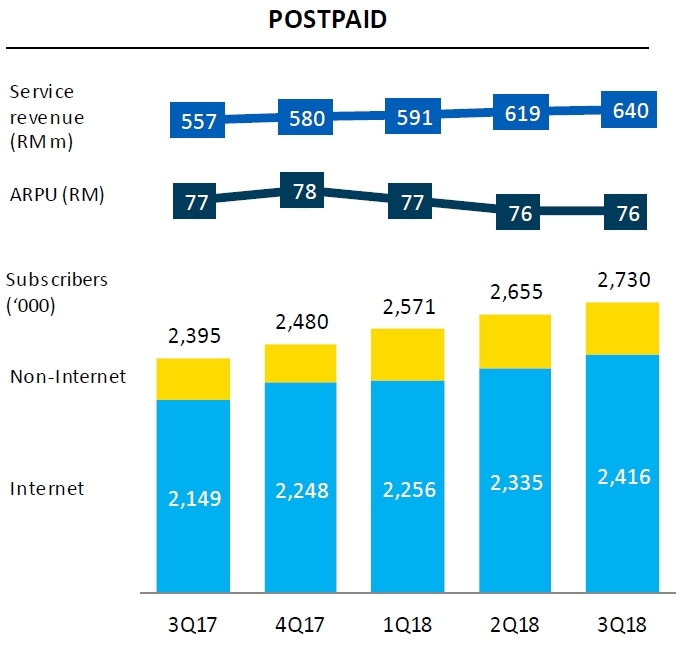 Postpaid ARPU remains unchanged at RM76, since 2Q18. 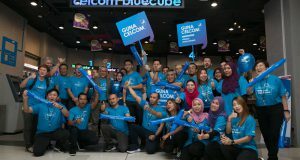 The Telco claims that its 4G LTE human population coverage now stands at 89% nationwide and 61% for LTE-A in 170 cities and towns. The MyDigi mobile app recorded increase in upsell transactions of 21.9 million, with over 2.8 million monthly active users on the self-serve platform.